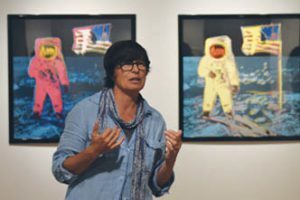 Lora Fosberg, Lubeznik’s director of exhibitions, discusses Warhol’s “Moonwalk” screenprint diptych, 1987, on loan from the collection of Wendy and Drew Levenfeld. Michigan City’s Lubeznik Center for the Arts presents original works by Andy Warhol on loan from the Drew and Wendy Levenfeld collection, as well as the Brauer Museum of Art at Valparaiso University, through Oct. 13. More than 50 works spanning the late 1960s through mid-1980s are on display, including a substantial collection of black-and-white photographs, Polaroids and large color screen prints, among which are the artist’s famous depictions of Campbell’s soup cans, the Moon Walk and Annie Oakley. Much of Warhol’s mundane, easily recognizable and everyday subject matter gave his work a democratic sensibility. Warhol employed strategies in his artwork that many contemporary artists use today. An exploration of these techniques is examined in categories such as celebrity, gender identity and popular culture by an invited group of artists whose work has been guided by Warhol’s legacy. Participating artists include Christopher Cosnowski, Dominic Sansone, Robyn Day and CJ Hungerman. 219-874-4900 or www.lubeznikcenter.org. It’s New Orleans in Indiana on Sept. 15 when the Dukes of Dixieland join the Northwest Indiana Symphony for the opening concert of its 2018-19 season. The Dukes is a Dixieland-style revival band that plays New Orleans music from Doctor John and Fats Domino, to Huey Smith and Louis Prima. Originally formed in 1948 by brothers Frank Assunto on trumpet, Fred Assunto on trombone and father Papa Jac Assunto on trombone and banjo, the Dukes re-formed without the Asuntos in 1974, performing in the French Quarter before moving to a hall on Bourbon Street. Today their home base is the Steamboat Natchez. The Dukes of Dixieland have performed with orchestras throughout the U.S., including the Cincinnati, Cleveland, Chicago, National, New York and Boston Pops orchestras. They’ve even played in Carnegie Hall. In 2005, they traveled aboard the Steamboat Natchez up the Mississippi and Ohio rivers to Cincinnati, raising money for the Bush-Clinton Katrina Relief Fund, while many of the band members’ homes still were destroyed. Prepare to party like it’s Mardi Gras when the Northwest Indiana Symphony brings a little bit of the Big Easy to the Region. 219-836-0525 or www.nisorchestra.org. South Shore Arts presents the 75th anniversary edition of its annual Salon Show from Sept. 9 through Nov. 4. This regional exhibition is always an exceptional display of talent and creativity. A private preview brunch celebrating the exhibit’s milestone will take place from 11 a.m. to 1 p.m. Sept. 16 at the Center for Visual and Performing Arts, Munster. Admission to the brunch is $75. A free public reception and awards ceremony will follow from 1 to 3 p.m. with more than $10,000 in cash prizes announced at 1:30 p.m. The Salon Show is a tradition that has defined South Shore Arts since its inception in the late 1930s when 10 area artists launched an exhibition of visual art in the hat department of the Edward C. Minas Department Store in downtown Hammond. There was an interruption in the exhibit during the war years, but it resumed in 1944, becoming known as the Salon Show. Highest among the exhibit’s prizes has been the Surovek Award of Excellence, a $2,000 prize, established more than 25 years ago in memory of Helen V. Surovek. 219-836-1839 or www.southshoreartsonline.org. Click here to read more from the Aug-Sep-2018 issue of Northwest Indiana Business Magazine.